Out without using 2341 clue. Torch was used in first scene, hole right side of door. I escaped without using: the torch, the ladder, the hatchet, most of the eggs and several puzzles. 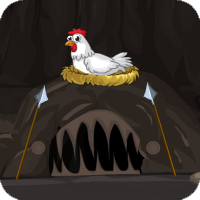 If you put one egg under a hen and then click on the chick a solution comes up that gets you the mace head and that's all you need to escape. This is a really broken game!